Why Are My Muscles Getting Smaller After Lifting Weights? Muscle growth is facilitated by an anabolic or building-up process called hypertrophy. Hypertrophy places a greater-than-normal strain on your muscles, is affected by a number of factors and can only occur in favorable physiological conditions. If your muscles are getting smaller, they are atrophying. Atrophy is a catabolic process that occurs if your training, diet or lifestyle is not sufficiently aligned with your goal of making your muscles bigger. If you're working out but aren't seeing muscle growth, it's time to review your workout routine and nutrition. Overtraining describes a state in which your muscles are not given sufficient time between workouts to recover and grow. If you train too hard and too often, the anabolic process of hypertrophy cannot occur. Include a couple of days off from exercise per week and include periodic phases of lighter or less frequent workouts to avoid becoming overtrained. According to Harvard Health Publishing, arranging your workouts to avoid exercising the same muscles on consecutive days as well as waiting at least 48 hours between strength-training sessions can help reduce risk of overtraining. You can't build muscle without good nutrition. Building bigger muscles requires protein, carbohydrates, fat, vitamins and minerals as well as a calorie surplus above your daily energy requirements. If you are training hard but not eating properly, you may find your muscles get smaller instead of bigger. If you are not gaining any muscle, you should make sure you are eating enough to fuel your workouts and the subsequent recovery process. Emotional and psychological stress cause the release of a hormone called cortisol. Cortisol is a catabolic hormone that facilitates the breaking down of body tissues for energy. If you are trying to make your muscles bigger, you should endeavor to keep your cortisol levels to a minimum by managing your stress levels and practicing relaxation techniques and breathing exercises. High cortisol levels are not conducive to gaining muscle and may result in your muscles getting smaller and weaker despite your training. Gaining muscle and developing high degrees of cardiovascular fitness are counterproductive. Cardio exercise encourages your body to break down excess muscle to make activities such as long-distance running or cycling easier and more economical. 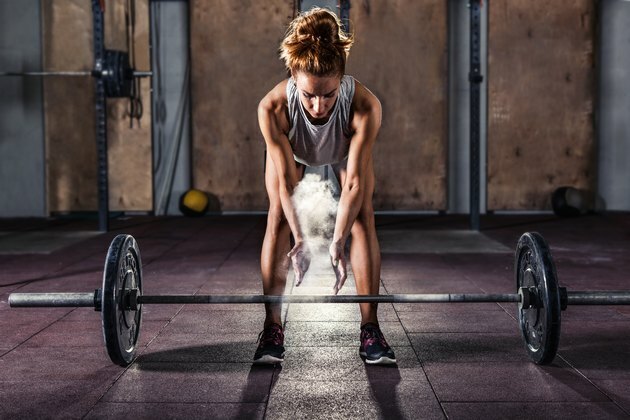 Performing short, infrequent cardio workouts is beneficial for your heart and lung health, but long cardio workouts can have a negative effect on your ability to gain muscle and may even lead to your muscles getting smaller despite frequent weightlifting sessions, according to the International Sports Sciences Association. Muscles get smaller and weaker with age. Regular bouts of strength training can slow this catabolic process — called sarcopenia — but will not stop it completely. Anabolic hormone levels decrease with age, which over time leads to a reduction in muscle mass. The main anabolic hormones are testosterone and human growth hormone. Levels of these hormones naturally decline from the age of 40 years onward, according to Harvard Health Publishing. Read more: What Are the Benefits of Gaining Muscle Mass? Why Is Muscle Endurance Important? How Long Does it Take for Muscles to Grow After Working Out? What Is a Good Way to Get Ripped Without Weights?